Last night, I screened Network for a group of graduate students I'm teaching in a screenwriting program. I want them to study the Academy Award winning scripts by the greatest screenwriters of all time - in this case, the work of Paddy Chayefsky. Though produced thirty years ago, I was reminded of the old adage "the more things change the more they stay the same." 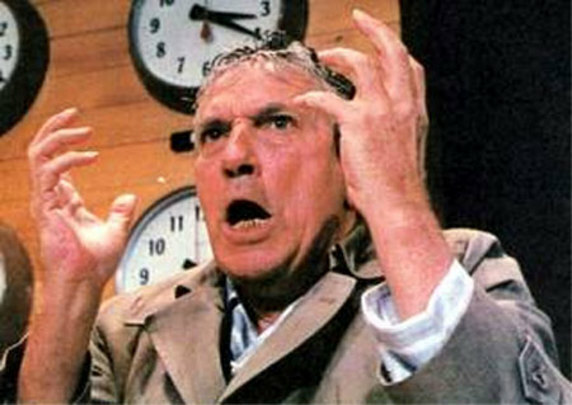 The clothes may have been out of style, the actors far younger than they look in more recent films and television shows, but the ethics governing the programming on television and the frustration of Howard Beale (Peter Finch) startle with their continuing relevance. Howard has a mental breakdown on the air. Rather than supporting him and getting him help, various network executives alternately fire him and re-hire him to exploit his deranged crack up. The recent media feeding frenzy featuring Paris Hilton, Lindsay Lohan, and Britney Spears as they struggled through alcohol, drugs, clothing, and other challenges shows us how exploitive tabloid TV can still be. Howard's frustrations due to losing his job echo through to today's uncertain economy with jobs being cut, housing foreclosures, the Wall Street bailout, and the stock market collapse. I could very easily imagine people hanging out of their windows tonight screaming "I'm mad as hell, and I'm not gonna take it anymore." Network executive Diana Christenson (Faye Dunaway) wants to start a television series that features real-life terrorist acts as a ratings-magnet. The exploitive nature of present day reality programming coupled with the shockingingly graphic scenes in television news and film show us that there are network and studio executives today with the same values, or lack thereof, as Diana. Maybe that's why I think these graduate students are so important, why I think teaching this class is so important. Hopefully, I and others teaching around this country can train a generation of writers, producers, executives, and filmmakers to view their work as a vocation, to view Hollywood as a mission field, as a place to invest their values, rather than a place to go to once they've left their values behind.